Home › Pix of the Trade › Sweet treat! 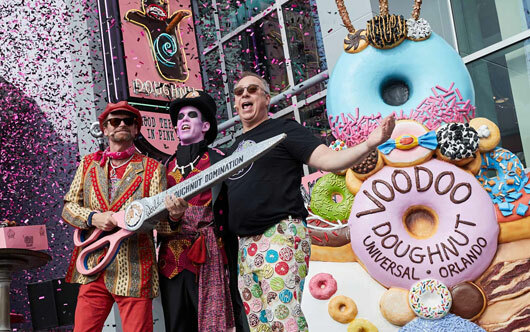 Voodoo Doughnut is officially open at Universal CityWalk with a unique line-up of more than 50 types of weird and sinfully delicious doughnuts. Known for its bold and offbeat vibe, the Portland-based shop is a perfect fit for the tastes of Universal CityWalk. Co-founders Kenneth “Cat Daddy” Pogson and Tres Shannon led the celebration, where – for the very first time live in person – they introduced the charismatic brand icon, the Baron of Voodoo Doughnut. Their eighth location builds upon the Voodoo Doughnut partnership with Universal Parks & Resorts, which began more than a year ago with the successful opening of Voodoo Doughnut at Universal Studios Hollywood. The Orlando location is the first Voodoo Doughnut on the east coast.